It used to be that whenever sports facilities made upgrades or changes to their venue, they would just toss the old stuff out because it was considered to be, well…junk. Then somewhere along the way, someone much smarter than I am figured out that fans would pay a pretty penny to add the “junk” to their sports memorabilia collection. When Wrigley Field made renovations a couple of years ago, they were selling their old stadium seats in pairs, at a whopping $899 plus $132 shipping. For $1,032 – you could bring a century of Chicago Cubs pain and futility right into your living room. My alma mater, the University of Tennessee, changed from artificial turf to natural grass at Neyland Stadium following the 1993 season. I paid $20 for a three-by-five inch square of the old artificial turf set in hard plastic with a small tasteful commemorative plaque describing what it is. I still have it on my office bookshelf today. 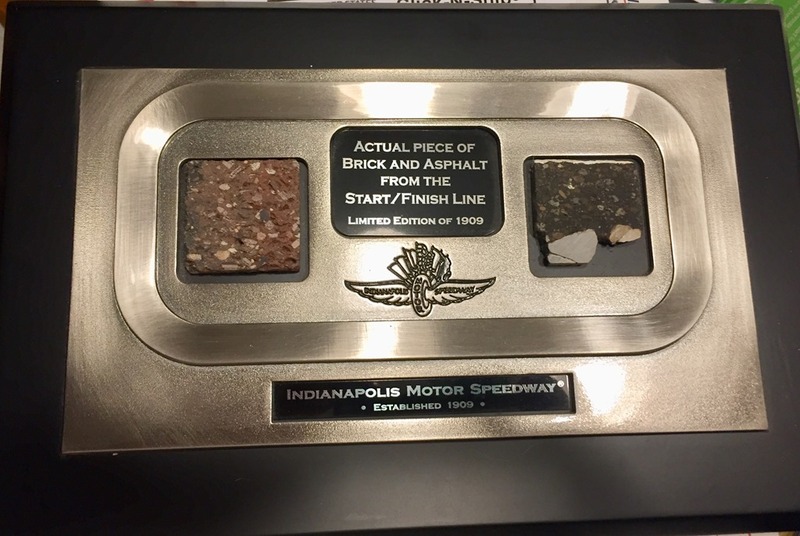 About ten years ago, Susan gave me a plaque made from the last resurfacing of the Indianapolis Motor Speedway, which took place before the 2005 race. It features a slice of brick and a slice of asphalt from the start-finish line, complete with a stripe of white paint on the top of the asphalt. The plaque says it is a limited edition of only 1,909. I guess there were just so many slices from a track that is only fifty feet wide. I have enjoyed having that as part of my collection. The last resurface before the most recent was done in the fall of 1995, so it was after the last CART race there. Still, I’ve long looked at that strip of asphalt and wondered how many legends (as well as many non-legends from the early IRL days) drove across it in pursuit of victory. It was down when Helio Castroneves won his first two, and when Juan Montoya won his first. I don’t know how much she paid for it, but I can assure you it wasn’t cheap. Mounted memorabilia at the IMS gift shop in limited quantities is never considered much of a bargain. But now, IMS is giving us what I do consider a bargain. In the 1950’s and 60’s; green folding chairs, were installed along Grandstand B and the Stand B Penthouse. I also remember sitting in green folding chairs when I attended my first race in 1965. We sat down low in Stand J. When I returned in 1967, we had moved to Stand A – very close to where my seats are today. Those were permanent seats that were essentially benches with backs to them – again, pretty similar to our current seats. But I know the green chairs were still very prominently placed throughout Stand B recently, because I remember sitting in some during qualifying just a few years ago. After the 2015 season, major upgrades and changes were made to several stands as part of Project 100; in preparation for the 100th Running in 2016. Part of this included replacing the iconic green chairs that had been in place for over half a century. The change was a good one, as patrons got an actual stadium-type seat with an armrest and cup-holder. Thankfully, they chose green as the replacement color as an intentional nod to the past chairs that sat there for generations. This past Friday, it was announced that the Indianapolis Motor Speedway will be putting these chairs up for sale to the general public. Keep in mind, there is nothing fancy about these chairs. They are your standard folding chair that you’ll find in any office storeroom or church rec-room. The only difference is that they are old, weathered and painted green. I don’t know if The Speedway painted them green or if they originally came that way. Whatever the case, they were always a uniform green that just seemed to be a part of the facility. To look at them, there is nothing special about these old ordinary-looking chairs. But, oh the history they have witnessed! You can see in these two photos that the chairs were in the background for the qualifying photo of Eddie Sachs back in 1962. They were still there as AJ Foyt was riding through the pit area on the morning of the 2015 race, some fifty-three years later. This article says that some were installed in 1956. Others were installed in the sixties, but it doesn’t say which year. I am going to assume it was in the earlier part of the decade, but I don’t know that for sure. But we know the 1956 chairs saw George Salih’s Belond Special win twice, in 1957 and 1958. They also witnessed the poorly designed starting procedure in both of those years, which may have led to the misaligned start in 1958 that led to the death of popular driver Pat O’Connor. The older chairs were also in place throughout the entire IMS career of AJ Foyt and in the days when the entire field contained front-engine cars. Assuming the newer chairs were in place by 1964, they were sitting there that horrible day when Eddie Sachs and Dave MacDonald were both fatally injured on the conclusion of Lap 2 of the 1964 race. All of the green chairs were most likely in place when the turbines of Andy Granatelli were turning heads and raising eyebrows in 1967 and 1968. They saw every win of all three Unsers and Roger Penske’s first and most recent win as a car owner in 1972 and 2015, respectively. Many of these chairs may have even been soaked with methanol during the start of the 1973 race, when Salt Walther’s car sprayed raw fuel into the stands as he spun helplessly upside down. They were in place during the rain-soaked years that saw three of four Indianapolis 500s end early due to rain in 1973, 1975 and 1976. Those chairs had probably been there for over a decade when Sid Collins called his last race in 1976. The chairs saw AJ Foyt win his last, Al Unser win his third and Rick Mears win his first – all in a three race span. Tom Sneva roared past all of the chairs when he first eclipsed the 200 mph mark in 1977. They were also sitting there when Tony Hulman rode with Foyt in the pace car that year before passing away later that fall. When Rick Mears and Gordon Johncock waged their famous battle at the end of the 1982 race, no one was sitting in those green chairs because they were all standing. But they were there, nonetheless. Those sitting in the chairs in Stand B were within eyesight of the now-famous spin & win by Danny Sullivan in 1985. Although they were decades old, the chairs were there two years later when Al Unser won his fourth “500”. They were still there in 1991 when Rick Mears won his fourth. All told, at least some of the famous green chairs were there for every win for each of the three four-time winners. Most likely, all were in place by the time Foyt won Number Three in 1967. They were all aligned that day in 1993, when Foyt took his final lap while announcing his retirement. I sat in some of the green chairs for part of that Bump Day in 1995, when Marlboro Team Penske inexplicably failed to qualify for the race. The chairs were there when Penske returned in 2001 and Helio Castroneves climbed the fence for the first time and each time since. When Sam Hornish overtook Marco Andretti just before the yard of bricks in 2006, he did so with the iconic green chairs in attendance. When JR Hildebrand crashed on the final lap of the 2011 Indianapolis 500, he came to rest in front of Stand B, which was filled with these green chairs – as the winning car of Dan Wheldon flew by, just moments earlier. After being there for many tries, the green chairs were still there for Tony Kanaan’s popular win in 2013. If only these chairs could talk, just imagine the stories they could tell. After being there for more than half a century of racing history, the last Indianapolis 500 moment for the chairs was when Juan Montoya won in 2015 for the second time, after scoring his first win in 2000. 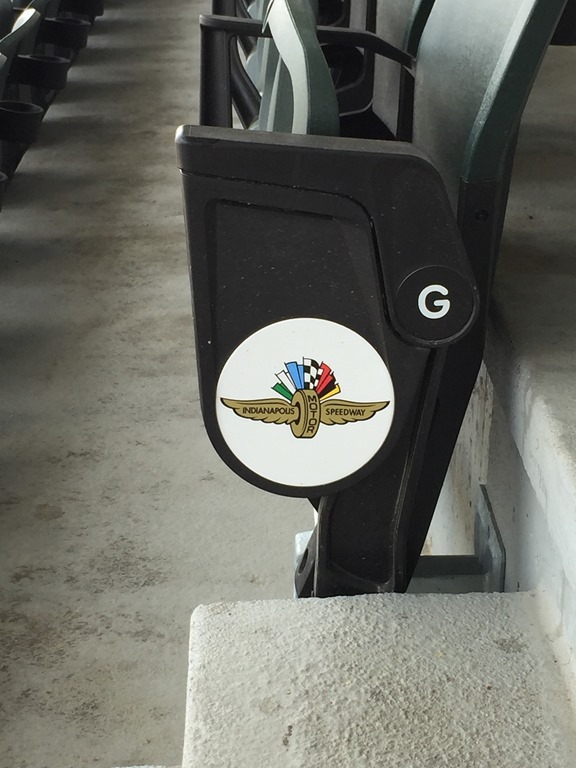 The chairs were also there for every Brickyard 400 up until 2015. I also sat in the green chairs when I went to Formula One Qualifying in September of 2002, as they sat there for every F1 race that took part at IMS from 2000 to 2007. They were also there for the first two Grand Prix of Indianapolis, including the infamous standing start in 2014. These chairs were sitting there as names like Foyt, Clark, Andretti, Unser, Mears, Rutherford, Castroneves, Franchitti, Wheldon, Gordon, Earnardt, and Schumacher all went to IMS Victory Lane. They were present when drivers Mike Spence, Jim Malloy, Art Pollard, Swede Savage, Gordon Smiley, Jovy Marcelo, Scott Brayton and Tony Renna had crashes which ultimately ended their lives. 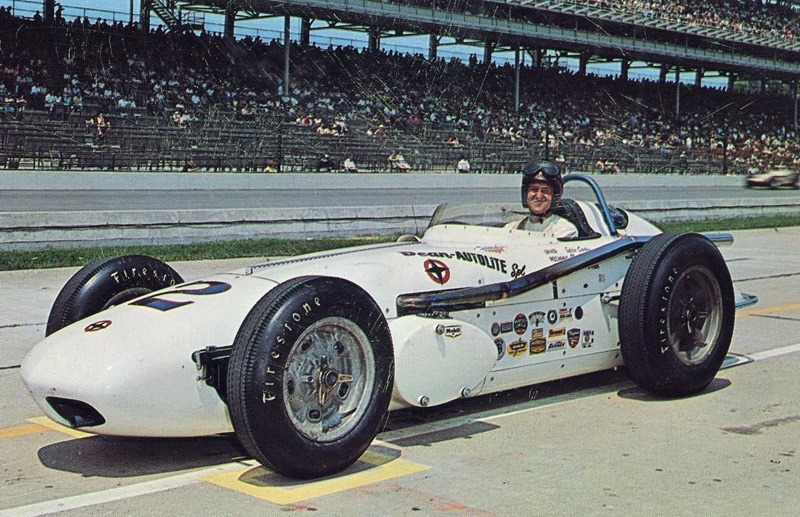 In addition some of the chairs were present during the two previously mentioned fatal accidents in 1958 and 1964; as well as Jerry Unser’s crash in 1959, which ultimately took his life, Tony Bettenhausen’s fatal crash during practice in 1961 and driver Chuck Rodee, who died in qualifying in 1966. Some of you may not be aware that occasionally, the stands are taken down and rebuilt during the offseason. I didn’t know that until we were at the track in December of 2012. Imagine my shock when I looked out from the museum steps to see that part of Stand E was missing. 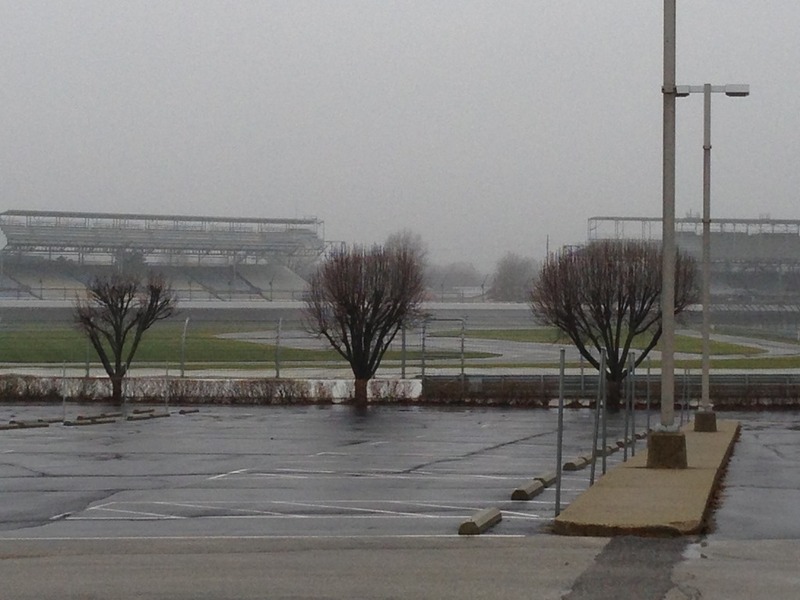 I later learned that tearing down and rebuilding stands every few years is part of their routine maintenance at IMS. I point that out to say that even though the stands have changed, the chairs remained the same for over half a century. Now, we can all own a piece of history from the track for a somewhat affordable cost. The older chairs that have stood since 1956 are being sold for $75. Those that were installed in the sixties are going for $50. If you are a ticket holder for any 2018 race, you get a $10 discount. With that comes a commemorative plaque to authenticate your purchase. Is it mounted to the chair? That, I don’t know. If you live within the contiguous 48 states, you can opt to have the chair or chairs shipped to you. But that’s the kicker. Shipping is $55 – ouch! So some are wondering if I am going to put my money where my mouth is. Well, sort of. I bought the chair from the sixties, since that’s when I started going to races there. With my ticket-holder’s discount, I paid $40 for the chair and I’m having a friend pick it up for me. I will get it from him when I see him in May. There is no tax or additional handling fee. The total cost was $40. I’m not sure Susan is overly excited to see something that big come into our house, but it will go straight into my man-room – along with all of my other pieces of racing memorabilia. She may not be excited, but she understands. Of course, what I’d really like is one of those numbers from the old scoring pylon that came down after the 2014 race. That would really looked good hanging from a wall. I’m sure Susan would think so, too. Actually – I think she would. 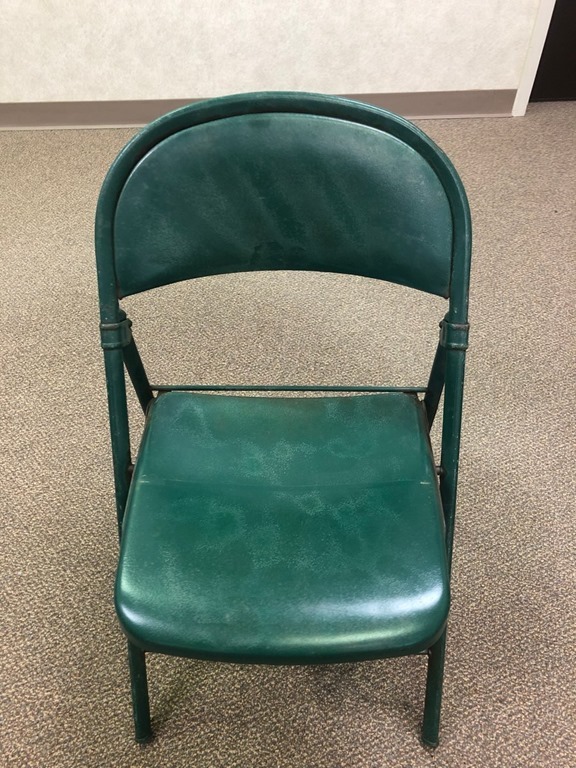 If you look at this as just an old, weathered, and ordinary folding chair – you may think $40 is kind of high. 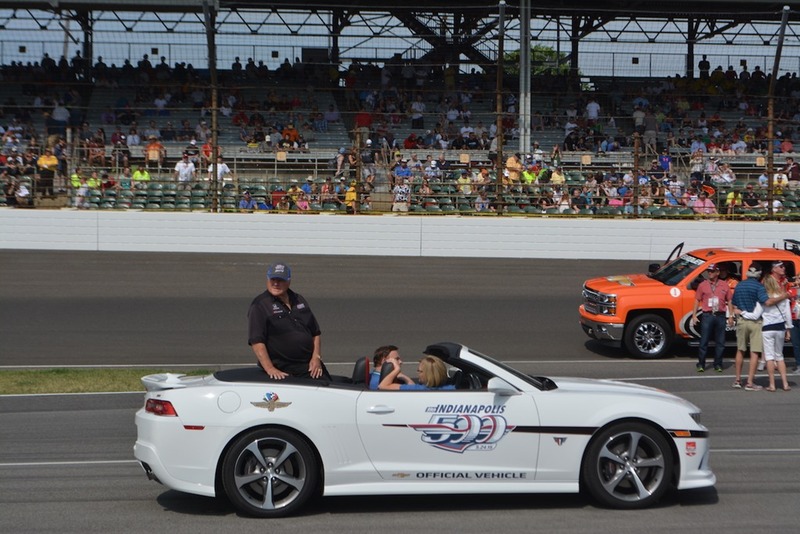 But if you look at it as a fixture of the Indianapolis 500 that was there for more than half of the races in the track’s history – $40 is a bargain. I don’t know how many they had, but I know I saw a lot of people on social media besides myself that bought at least one on Friday – and that’s just people that I know. For $40, I can’t imagine these will last real long. So if the chance to take home a piece of history appeals to you, click here and order yours today. This entry was posted on March 19, 2018 at 4:04 am and is filed under IndyCar. You can follow any responses to this entry through the RSS 2.0 feed. You can leave a response, or trackback from your own site. You are a treasure George Phillips. One hell of a lot of time and research went into this post. Much appreciated. As I read through this I began thinking which of those events had the greatest impact on me. When Eddie Sachs died we were next to the fence on the back straight and could hear nothing on the loudspeaker. We could see a huge cloud of thick black smoke from the area of the front straight and knew only that something very terrible had happened. And then there is Tony Bettenhausen Sr. Tony was my guy. I became a fan of his after I began watching him race and usually win at Milwaukee when I was a boy. That was a shock. Keep on bloggin’ dude. You have skills! I’m going to print out this article and frame/hang it above my chair. Nice work George! I will use my chair while watching sports and hanging out. Maybe I or someone from my family sat in it once. Who knows, but I am glad to be getting one. The reminiscing of all the chairs have seen… I have… emotions about it. Really nicely written piece today, George. As soon as I saw that they were for sale I ordered mine. That’s as good a part of racing history as you could possible own from the IMS. I could hardly type the key’s fast enough in fear that they would be all gone. I told my wife, just throw it in the grave with me when that day comes. George, this post is an awesome piece of writing. It takes very special skill to write such an interesting, even exciting story about a bunch of old folding chairs. I sat in several of those chairs in the 60s and early 70s. George Phillips……………Chair man of the board. Too right! it won’t go with my decor, but the chairs are a one of a kind treasure. IMS should provide George with an endowed chair. Another possible collectible: A dead “killer bee” of the ones that attacked A.J. , in a little glass case, along with a autographed photo of A.J.s swollen face. Ordered mine and hope to pick up in person at the oval test next week! Robert – Would appreciate your giving us an update here on Oil Pressure along with at least two photos. As soon as I got the email from The Speedway I clicked the link and purchased 2 for our house to be picked up on rescheduled practice days and one to be sent to a dear friend in NH. Worth every single penny because of the many things you wrote about. Fantasic post. Well written and researched.